When your wedding day is over, the wedding cake has been eaten, your beautiful dress has been cleaned and is stored up in the loft or sold on eBay, the only things you have left of your special day are your memories and your wedding photographs, but in time your memories fade and there will be an increasing need for your photographs to remind you of the details of your special day. There is a saying “good wedding photography is not expensive but bad wedding photography is an expensive mistake” and that is so true, so here are a few things to bear in mind when organising your wedding and choosing your wedding photographer. Does the photographer have insurance? It is really important that you book a professional wedding photographer that has Public Liability and Indemnity insurance. This is to protect you and your guests as well as the photographer. Don’t be embarrassed to ask to see a copy of their insurance certificates. Is the wedding photographer a qualified member of a professional organisation? In itself this is not a necessity but it gives you the assurance that the photographer has the level of knowledge and expertise to have gained a qualified status within a professional photography organisation such as The MPA (Master Photographers Association), The BIPP (The British Institute of Professional Photographers), The Guild of Professional Photographers etc. The images they submit for their qualification are judged by a panel of experienced and in most cases highly qualified photographers and they have to satisfy certain criteria before they are given qualified status. Does your wedding photographer know your venue? You may not think it but this does not really matter if you have booked a professional wedding photographer as they should be able to photograph at any venue! You may argue that if the photographer knows the venue then they will know all the ‘best spots’ to take photographs. 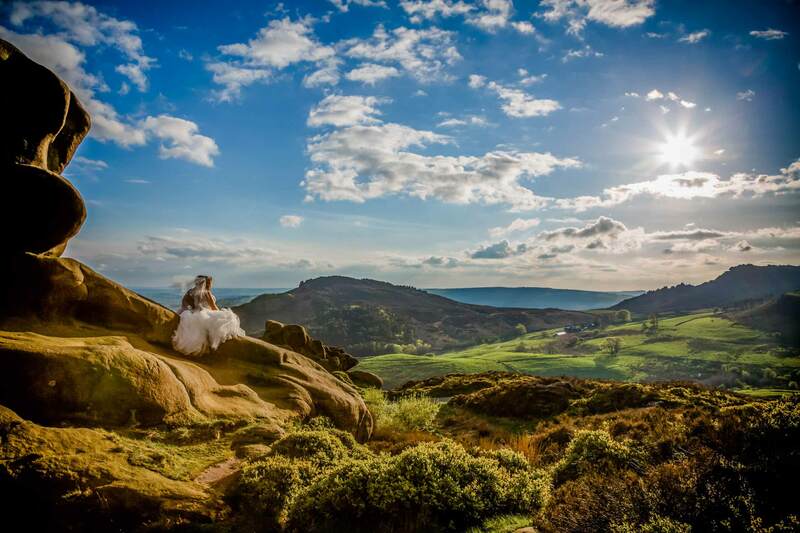 However, if your photographer visits the venue prior to the wedding to have a look around (or even if they get to the venue early on the day to have a look around) they will be able to see the ‘best spots’ due to the available light and the scenery etc. Sometimes it is nice to have a photographer that has never shot at that venue before or hasn’t been there for a while as they may have different ideas for shots. Is your wedding photographer flexible? Is the wedding photographer willing to work with you so you get the wedding package that you want or are their packages set in stone? If they are not flexible with their wedding packages, or with meeting you out of normal business hours, it is unlikely that they will be flexible on the day and will stick rigidly to a script. A wedding day isn’t like that, things happen, the bride is late the food is early … a good professional wedding photographer is flexible and can adapt to constantly changing situations. Candid wedding photography is extremely popular at the moment, but not all clients are aware that the natural shots that they have seen in magazines or on the internet and want in their wedding album have been, in most cases, set up by the photographer to capture them in a way that makes them look natural, so make sure your chosen wedding photographer knows how to pose you and how to make it look as though all those special moments have been captured just as if they had naturally happened! The reportage style of wedding photography is also popular but true reportage photographers have little or no interaction with the bride and groom or their guests and rely solely on waiting for things to happen to get their images. This kind of wedding photography is not for everyone and not every wedding photographer can do it well. Certain things that you want captured may not happen naturally at your wedding, so if you want certain images, this style of wedding photography may not be for you as there will normally be no set up group shots and no posed shots of the bride and groom and although this may sound appealing (as not many people actually like having their photograph taken) it may be a decision you come to regret. Traditional style wedding photography is where the wedding photographer sets up every shot; this normally consists of very formal and traditionally posed and lit images with many group shots which take time to set up. Traditional wedding photography has its place, after all there is nothing more traditional than a wedding, but not everyone wants a whole album of this kind of photography. Ask the photographer if you can see some sample wedding albums of actual complete weddings. Anyone can put together an album of their ‘best’ work which may be taken from weddings, or training days or model shoots, which is what you will usually see on a photographer’s web site, but you will want to see if their work is consistent and a good way to do this is to look at some complete wedding albums of actual weddings they have photographed at various locations, a church wedding, a civil ceremony and if you are wanting coverage of the speeches or up to and including the first dance, ask to see an album which includes coverage of this. A good professional wedding photographer can bring together elements of all of the above styles of wedding photography to provide you with a range of images that tell the story of your day. You are paying a professional for their technical expertise and artistic ability to see things with their trained eye. We all have an ‘Uncle Bob’ or a friend who is “doing photography at college” or has photography as their hobby and it is true that with modern digital cameras, ‘Uncle Bob’ etc. can take copious amounts of images that are of reasonably good quality but will they be in focus, will they be the right shots and will they be in the right locations and posed correctly? Just because they have a good camera it doesn’t mean that they will produce good photographs (I have a good pair of hairdressing scissors but that doesn’t mean I can give a good hair cut!). That is why you are paying a professional photographer so that you know you will be leaving nothing to chance, as after all, that day, that moment in time will only happen the once and you can’t afford to leave anything to chance and your wedding photographs are all you will have to remind you of your special day. How much have you budgeted for you wedding photography? Work out as a percentage how much of your overall wedding budget you are intending to spend on wedding photography, you will be surprised how small a percentage it is, yet after your memories have faded it is the only tangible thing you have left to remind you of the events of the day. Some couples’ main consideration is how much the photography will cost. There are some photographers who compete on price, these are mainly the part time photographers who have a full time job and wedding photography is a ‘paying hobby – (not to say that these photographers aren’t any good, some of them are) and although this should not stop you booking them, it should be a consideration (can they get the time off work …. will their ‘day off’ to shoot your wedding be cancelled by their place of work at short notice leaving you in the lurch …. this happens all too often). Also after care – will they be available when you need them, can they afford you the time you need after the event? Your budget will have a limit and that is understandable as costs will spiral if you don’t keep them under control, but go for the very best package you can afford. If you find a photographer that meets all your criteria – and you like them but they cost a little more than you wanted to pay but you can afford to stretch you budget that little bit, then do it because professional wedding photography is well worth the expense! I go back to the saying “good wedding photography is not expensive but bad wedding photography is an expensive mistake” and there is nothing like well composed images and captured details and moments to transport you back to your special day. If you have stretched your budget to the max, talk to your photographer to see if they can work with you to get a little nearer your budget but don’t be un-realistic, your budget will have limits and as such will determine the extent to which your purse strings will stretch and if the photographer’s packages are too far outside of your maximum budget, negotiation may be pointless and embarrassing! Probably the most important thing … Do you like the photographer? Do you like the photographer and feel comfortable with them? If you want your bridal preparations photographed, would you for example feel comfortable with them photographing you in your underwear? The chemistry has to be right or you will not get the photographs you want because your feelings will show in the images (a picture paints a thousand words!). So the important thing is to commission a wedding photographer who you feel comfortable with and feel you can work with as they will be spending a long time with and around you and your guests on your wedding day. When you are booking your wedding photographer go with the one you feel most comfortable with, even if they are more expensive than some of the others you have seen, go with your instinct, it will pay dividends in the long run. Make sure you meet the photographer who will be photographing your wedding! After you have chosen the photographer that you feel comfortable with it would be devastating to find out on the wedding day that the company you have booked sends a different photographer! Although this can happen on extremely rare occasions due to illness or accident to your booked photographer, some photographers take numerous bookings for the same day and then employ other wedding photographers to cover those weddings. Make sure the photographer you have met and feel comfortable with is the one who will be covering your wedding! Photographers work in many different ways, some charge an hourly rate for their attendance and everything else is at additional cost; some wedding photographers include absolutely everything in their package so there is nothing else to pay and other wedding photographers provide some things but not others in their packages. Make sure your expectations and those of the photographer are the same, make sure that you understand exactly what is included in the wedding package you are purchasing, such as products included; attendance from one point in the day to another or the duration of time purchased. Make sure your chosen wedding photographer is only covering your wedding on your chosen date and is not rushing off to shoot another wedding or looking to leave in time to catch the second half of the football match on the TV or needs to be somewhere else at a given time … hurried photography is poor photography! So once you have chosen your wedding photographer, decided on your wedding package and negotiated a price, the contract needs to be clear and concise and clearly show what you are going to receive. If you are unsure of anything, don’t be embarrassed to ask the photographer to explain. Depending of the coverage you want you need to factor in the time required by your wedding photographer to get the required shots. Discuss the timings with your photographer – there is no use having a church ceremony that starts at 2pm and then sitting down for your wedding breakfast at 4pm. A church service can last anything up to an hour depending on how many hymns you are having, are you having readings, if so how many? Depending on your religion the ceremony can last a lot longer. Also, depending on how many guests you have invited to your wedding when you come out of the church all of your guests will want to congratulate you, I know it sounds daft but it can take up to half an hour for everyone to get out of the church …. and then time is needed to take any photographs outside of the church that you may want (if space is limited, it is easier if your ushers ask your guests to make their way to the reception venue before these are taken, as it speeds things up … a lot)! The distance between the church and reception venue also needs to be taken into consideration, how long does it take to get from one to the other? Factor in things like traffic and the speed at which your chosen mode of transport can safely travel. If you have given your wedding photographer a long list of required shots at various locations these take time to organise. Will you and the bridal party be greeting the guests as they enter the dining room for the wedding breakfast (commonly known as a line up)? If you have a lot of guests this can also take a considerable amount of time. Ensure you have factored in enough time to do the things you want on your day as well as to get the photographs you want … remember, hurried photography is poor photography! Are you going to feed and water your wedding photographer(s) ? Some photographers have it in their contract that you feed them. Most don”t expect to be sat on a table with your guests and be served a full wedding breakfast though. Your photographer works very hard on your wedding day to give you the best that they can so most will appreciate being fed and watered. If you have already booked your wedding photographer It may be worth checking your contract before the day to avoid embarrasement on either side ! After the wedding what are your expectations? How long will it be before you are able to view your wedding photographs; how will you view your wedding photographs; how long before your album or disk of images will be ready? The final question will depend on how long you take to choose the images for your album and the album supplier used. This should be set out in your contract, however this can be discussed with your photographer to ensure that you both have the same expectations.